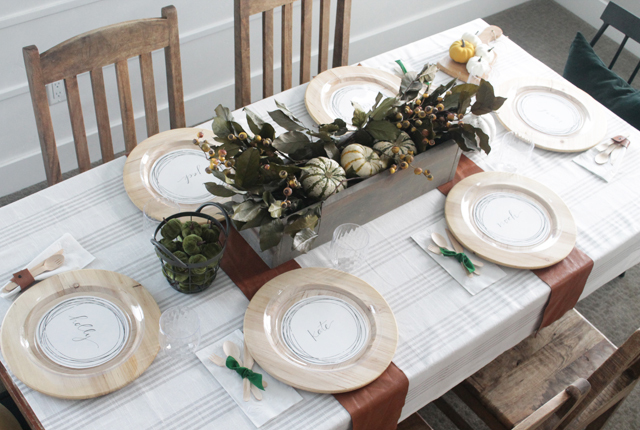 You don’t have to use your best dishes to have an elegant Thanksgiving table! 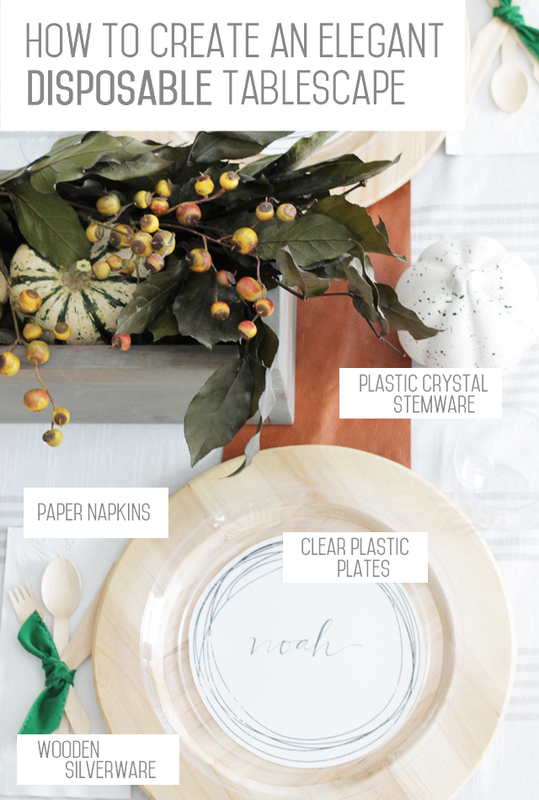 We’ll show you how to create a simple Thanksgiving tablescape using all disposable dinnerware. We’re also giving you a free printable for place cards or custom name cards to use under clear plastic plates. 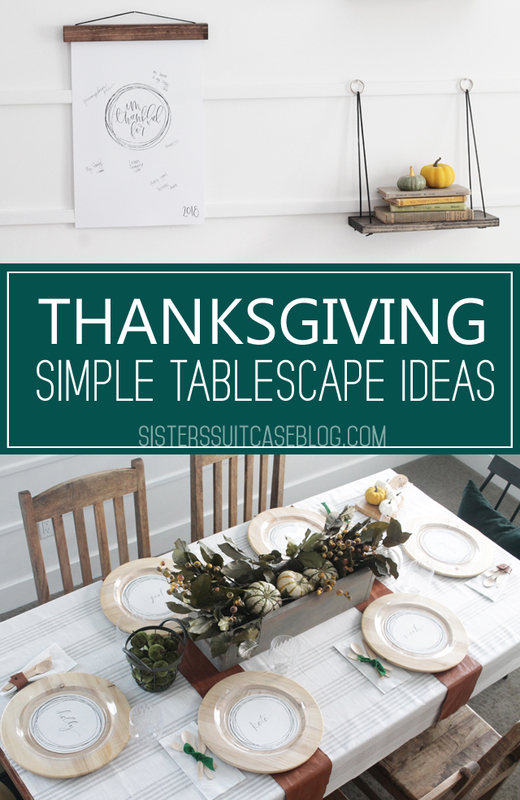 These easy designs will work for your main dinner table, or even a kids Thanksgiving table! The idea of hosting Thanksgiving dinner can be a little daunting, especially when you have to plan for a beautiful table and then think about all the dishes that will pile up after dinner! 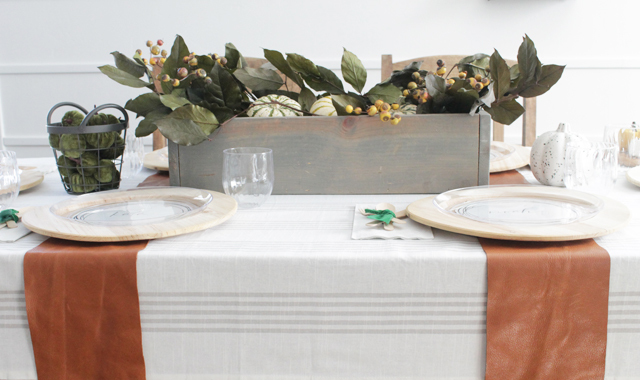 So today we are sharing a simple, elegant Thanksgiving tablescape that is made entirely of disposable dinnerware! That means easy clean up and more time relaxing with family. Use crystal clear dinnerware – Clear plastic dinnerware creates the look of glass, and makes the dishes appear much more fancy than they actually are! 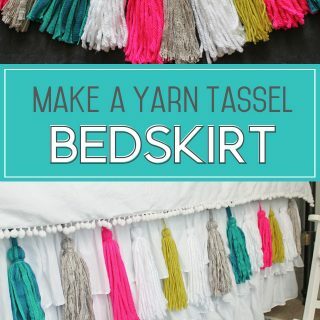 It also matches with every possible color scheme, so you are able to use what you have at home to complete the table design. For our table, I used 10″ clear dinner plates from Zurchers (here are some similar plates), and Cut Crystal stemless glasses from Chinet. Paper napkins are the only way to go! With a messy meal like Thanksgiving dinner, you don’t want to have to worry about washing up cloth napkins after your guests go home. Cranberry sauce can leave a nasty stain! Using paper napkins is more convenient, and they will still look great. Our favorite brand of paper napkins is Vanity Fair, and you can get them at any grocery store. 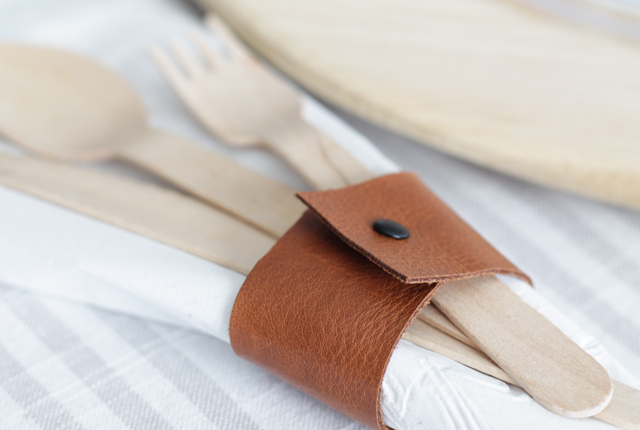 For a few of our place settings, we made DIY leather napkin rings to tie in with the leather plate runners. More on those later! 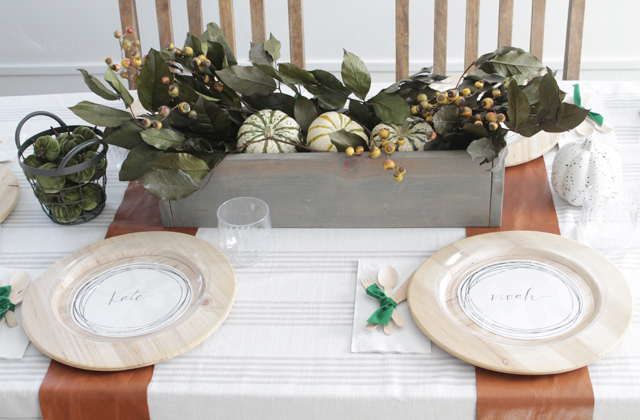 Shop your house for items you can use to decorate the table. Like I mentioned earlier, the crystal clear dinnerware will give you endless options for the design and color scheme of your table. 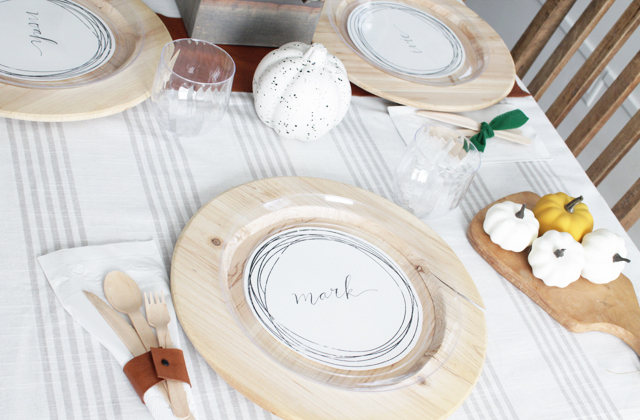 Use items you already have at home, like these wooden plate chargers, to create the design inspiration for the rest of the table. Once we had decided on the wooden chargers, we complemented the look with disposable wooden cutlery. I love these so much! I will be using them at many future parties! 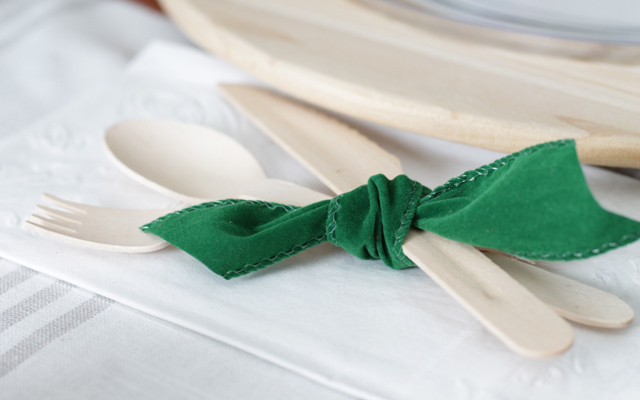 One of the colors we really wanted to incorporate into the design is this beautiful green, so we tied a bit of green velvet ribbon around the wooden utensils and it provided the perfect pop of color. My inspiration for this tablescape began with clear plastic dinner plates — I loved the idea of creating custom place cards to go under the plates. 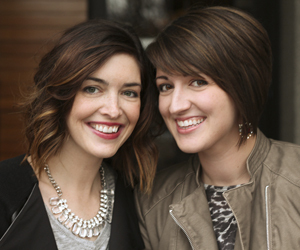 So I talked to my talented friends, Kim and Tori at JW Paper Co, and they designed this stamped circle printable for us! I sized it up a little to fit our large clear plates, printed it out on white cardstock, and wrote the names in the middle. Then I just trimmed around the circles, and slipped them underneath the plates. I’m loving how they turned out! The design matches perfectly with their new Thanksgving print they just came out with, isn’t it cute? They have two different versions available, the circle design and the branches (pictured above.) 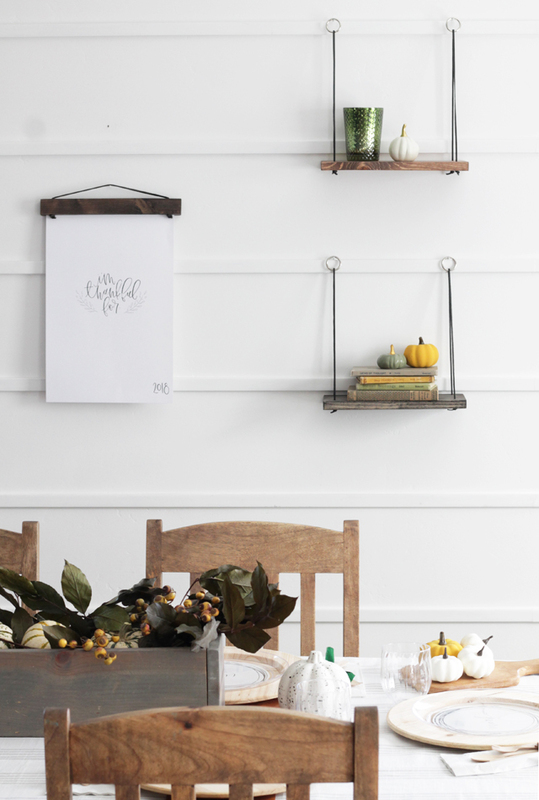 We are huge fans of JW Paper Co. and have a few of their wooden magnetic frames in our homes. I love that you can easily switch out a print or photo for the upcoming holiday! 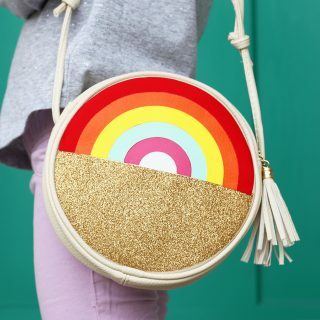 They just came out with an amazing bundle today at Brickyard Buffalo and we wanted to share it with you guys. 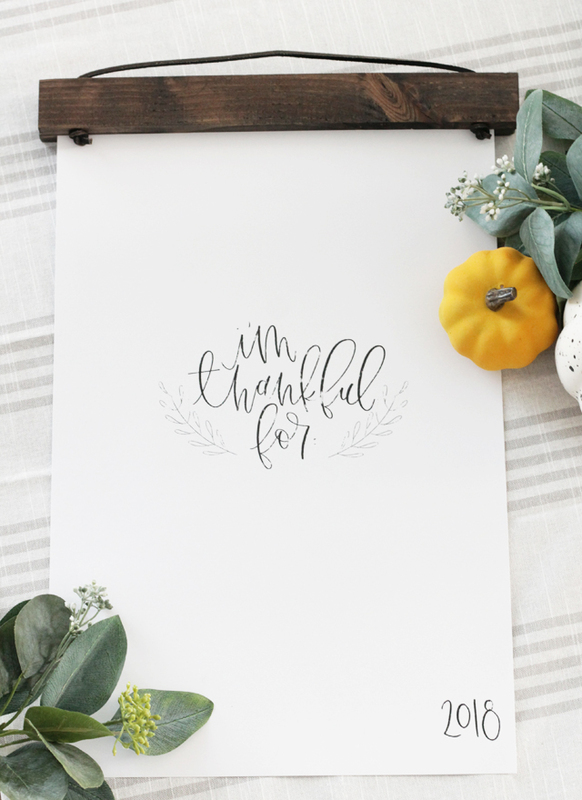 The Thanksgiving bundle includes your choice of 11×17″ Thankful print, wooden magnetic frame in your choice of stain, and a fine tip Sharpie marker for your family to write down all the things they’re thankful for! Normally the bundle is $25.99 but this week, you can get it for only $15.99! Such a good deal. Look how amazing it looks in this wall vignette with some of their hanging wooden shelves! 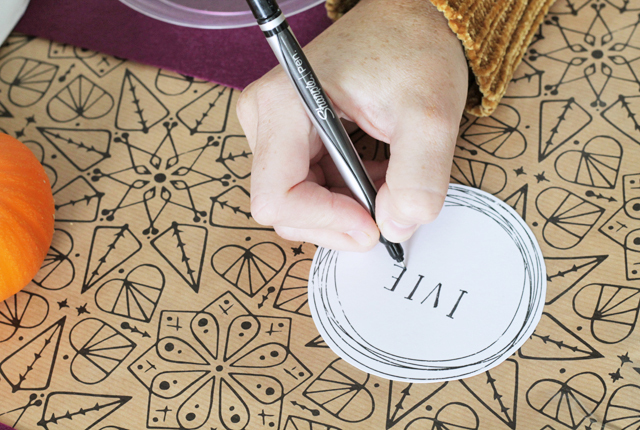 It really ties everything together for our place cards and table design! 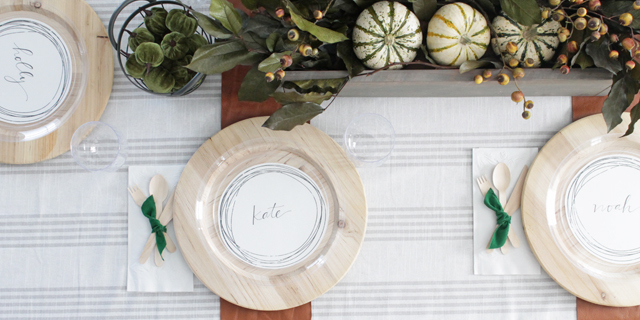 Now, back to a few of the DIY elements of our Thanksgiving tablescape! 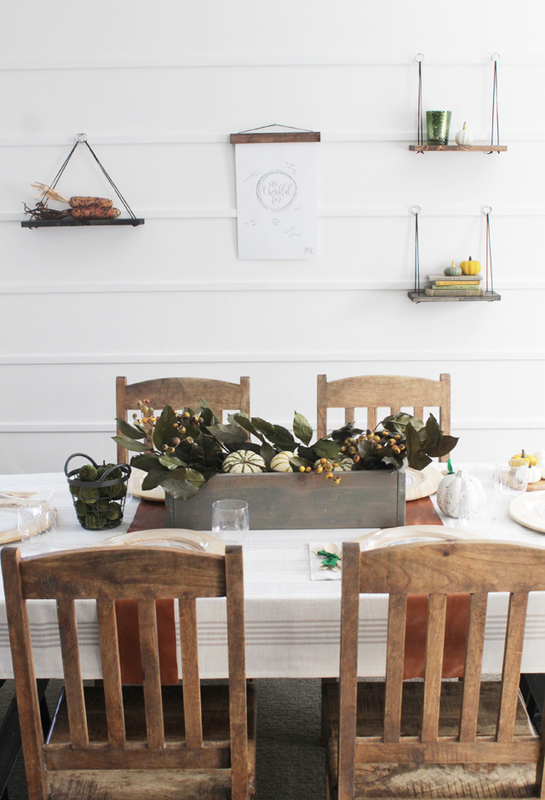 One of my favorite parts of the entire table were the leather plate runners we made. They were sooo easy! I had a leather remnant in my fabric bin, and I knew it wanted to tie in some leather for the warm caramel color and texture. I used an acrylic ruler to measure and cut the leather into two strips that are 6″ wide, and about 4 feet long. Then I used a few small scraps to make these leather napkin rings. 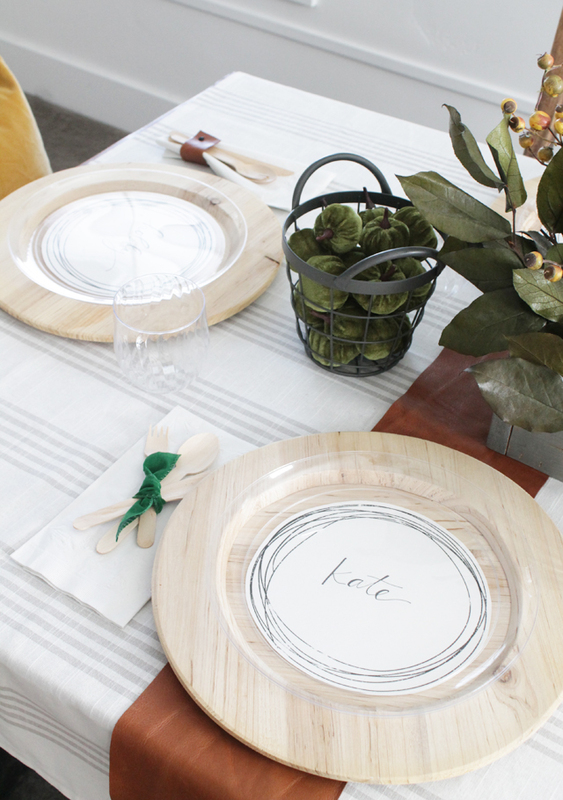 I just love how the leather contrasts the white and gray linen tablecloth and wooden chargers. This was one of my favorite uses of shopping my house and using materials I already had on hand to create a beautiful component to the tablescape. 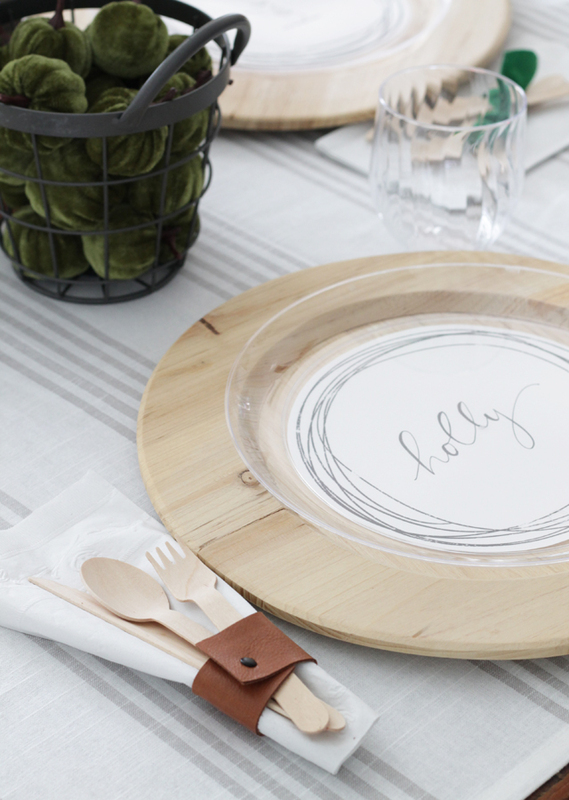 Finally, I wanted to share a really cute idea that uses the smaller size of stamped circle place cards for pie plates! 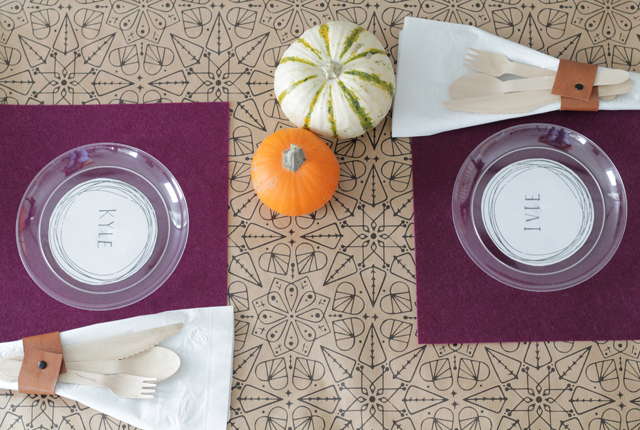 We put together a simple kids Thanksgiving table and used the printable place cards underneath these small clear plastic plates for pumpkin pie. I used my favorite Sharpie pen to write the kids’ names and they fit wonderfully under the 6″ plates. 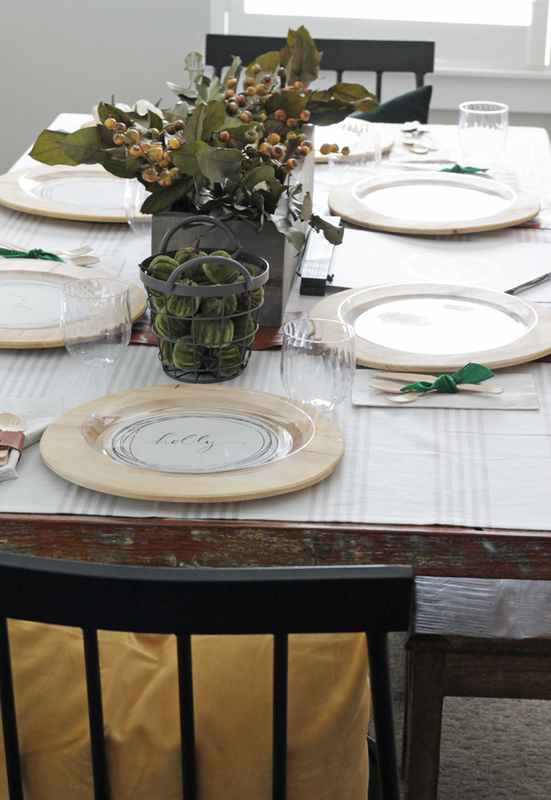 We used wrapping paper from IKEA for the table covering, and Cricut Felt sheets to make simple placemats. 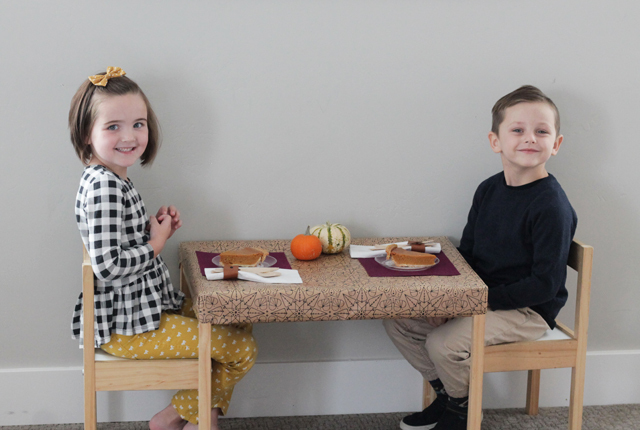 The kids enjoyed their little Thanksgiving table! 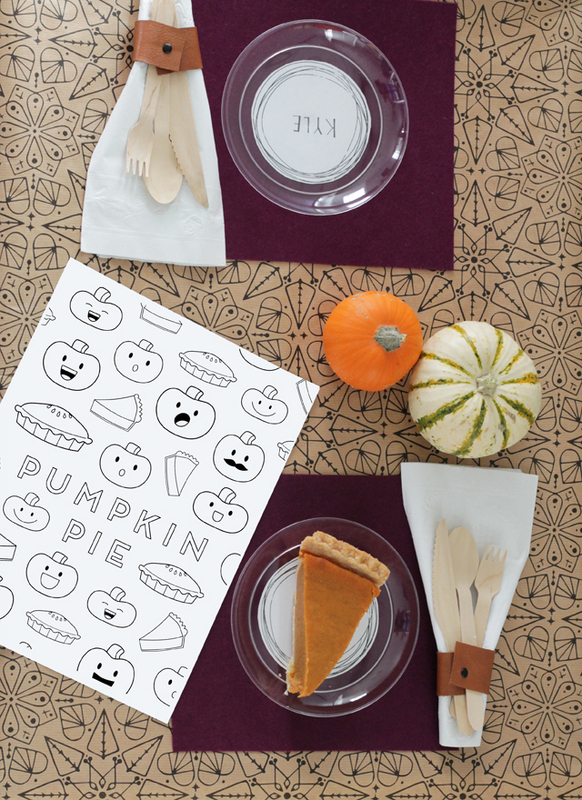 You can also download this adorable Pumpkin Pie coloring page HERE! 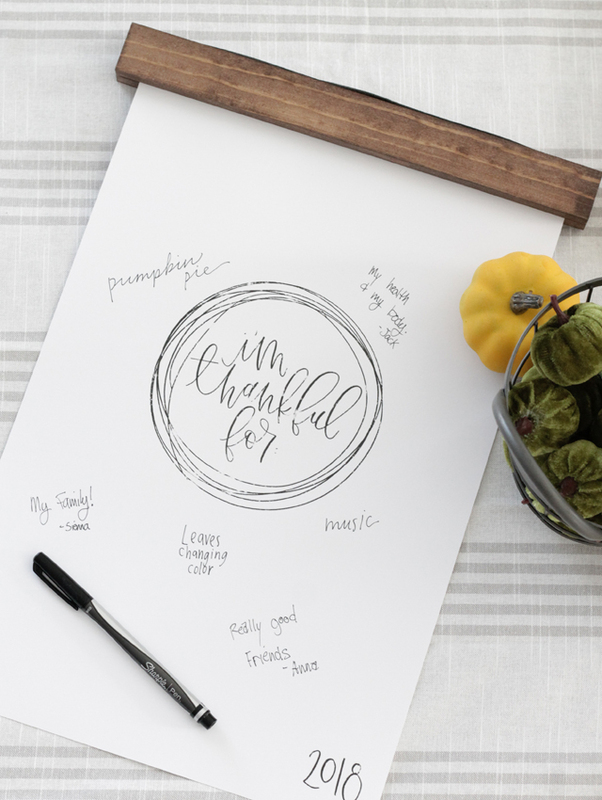 I’m just so happy with the whole design of my Thanksgiving disposable tablescape! It’s beautiful, and the best part is that the clean up will only take 5 minutes!